Advaya Tales | Travelling back to history & roots, with Elegance ! You wondered where we vanished after all the razzmatazz of our history and legacy. Well we thought why not put some action beyond all the stories and weave them together and charm you with some delight we curate . Hence without mincing too many words we would like to introduce our first range of merchandise, some silver trinkets to whisk you away from frequent occurrence of boredom . A glance through these pictures we can bet you wouldn’t be able to resist of possessing them . These beautifully handcrafted 92.5 silver with semi precious stone are head turners and are sure to dazzle in any occasion. Grab them fast to make a perfect ensemble . In continuation to my last blog to our time travel to Bengal Renaissance but have to mention that prior to arrival of the British , there were already many well established , sophisticated family in Kolkata with flourishing business . They traded in gold, silver, cotton , salt or were involved in shipping , transport etc. Much tempted with their prosperity and abundance British started taking over in the mid 18th century , these families had to think of some other options of sustenance , they had to join hands with the so called the lords of the provinces taken over and entered the administrations through various posts of ‘Munshis’, officials or commissioners . Soon they graduated to the titles of Rajas or most often sarcastically referred as ‘ejuraj’ or educated Raja, ‘Phool Babu’ or ‘flower-delicate fop’. They also commissioned British architects to build large mansions , mimicking antique doric , gothic & baroque styles among many others. The most common and major characteristics of all these mansions and Rajbaris ( as commonly referred ) were an inner courtyard with Thakur Dalan commonly used for Durga Puja, congregations, musical evenings or get together. The inner courtyard was surrounded by colonnaded balconies influenced from ancient greek and roman architecture. The family quarters were upstairs along with these balconies. Let’s take peek into some of the prominent families’ rich heritage and glories of their past. Mullick family had come into prominence from 17th century. Rajaram Mullick shifted to Kolkata from Triveni , his great grandson Nimaicharnan Mullick had invested in salt trade and real estate and in the process brought his family in political and social circle. At the time of his death he left 3 crore in his will . Baidyanath Mallick ( Ancestor ) climbed to the top of Chandranath Mountain to find an idol of goddess Durga ( Singhabahini ) . The priest of the temple gifted it to him and he brought it down with him to Triveni and later brought to Kolkata. The family adopted the idol has family diety . In year 1883, when Ramkrishna Paramhans ( Indian Mystic & yogi ) visited the family he was fascinated by the goddess and immediately entered a deep meditation . Three large structures have already come up next to this building , one of them is the Barabazar branch of Metropolitan school established in 1887. Jadulal Mullick had numerous contribution in social sector. At one time he donated enormously to Oriental Seminary from where he passed entrance , school leaving examination . His son, Manmathanath Mullick bought pair of Zebras from Alipore zoological gardens to pull his carriage through the streets of Calcutta. He even got his carriage painted in zebra colors . He had nine types of carriages and a stable full of horses. Which was very much talk of the town during that time. One of the grandsons of Jadulal Mullick Pradyunno Mullick had 35 cars, out of which 10 were Rolls Royce . Though the palace has a rich heritage and lots of tales woven around and Mr Bejonbehary Mullick ( descendants of Mullick Family ) seems to be taking a lot of pride and pleasure describing glories of the past . Unfortunately, with limited resources and funds it’s tough to manage such a large property . Nevertheless, they have managed to keep up the property to certain measures trying to preserve the lost heritage. Did you know the original constitution of India has each page beautifully drawn by artist Nandalal Bose . To illuminate text beautifully he had used gold leaves and colors made from stones . Nandalal Bose was also the one who drew the emblems for the India’s highest awards such as Bharat Ratna and Padmashri. He was awarded the Padma Vibhushan for his contribution and was a pupil of Abanindranath Tagore . He eventually became the Principle of Kala Bhavan , Shantiniketan . Born in Bihar December 1882, he had a keen interest in pottery, craftsmen , creating and decorating gods and goddesses . He moved to Kolkata when he was 16 year old to complete his high school and college. Stumbling upon Abanindranath Tagore’s work he decided to study under him. Highly impressed with Nandalal Bose’s artwork , he was recommended to Government college of Art . Travelling across so much to widen his imagination and he was deeply influenced with cave art of Ajanta and , Buddhist stupa of Gaya and Temples of Mahabalipuram . His some of the other significant contribution were influenced from Indian history and mythology . He had also illustrated many of Rabindranath Tagore’s stories and poems and designed sets and costumes for his plays. Rabindranath invited Nandalal Bose to Shantiniketan , where he went onto to become the first Principal of Shantiniketan’s fine arts college. He was greatly adored and respected by his pupils and this is where he first met Mahatma Gandhi . Deeply moved with his Dandi March , Nandalal created the famous black and white picture called “Linocut” . He also created lot of decorative posters of various Congress meetings which later became very famous. Nandalal Bose passed away in April 1966 and his more than 6000 of his works are showcased in National Gallery of Modern Art, New Delhi. Nandalal Bose’s mansion know as Basu Bati / Bari is still one of the Calcutta’s most fascinating mansions , located in Bagbazar. This enigmatic house is hard to find amongst the bylanes. Originally it covered an area of 14 acres but years of division the property has been drastically reduced . Many small hutments , shops and restaurants have come around the property to reduce the traces of the palace. With these encroachments the palace has been retreated to narrow lane from the main road. The exterior of the house is decorated , with massive columns with floral motifs and lion’s head connected by double rows of beads shaped in stucco. Islamic style archways open up to the ground floor with number of small waiting rooms and store rooms with large evidence of decay and rising damp. Originally the house boasted of four courtyards , the most magnificent being the main courtyard known as “Thakur dalan”, surrounded by tall columns. Like any other house, courtyard is an important part of the house where various religious and family ceremonies were performed . 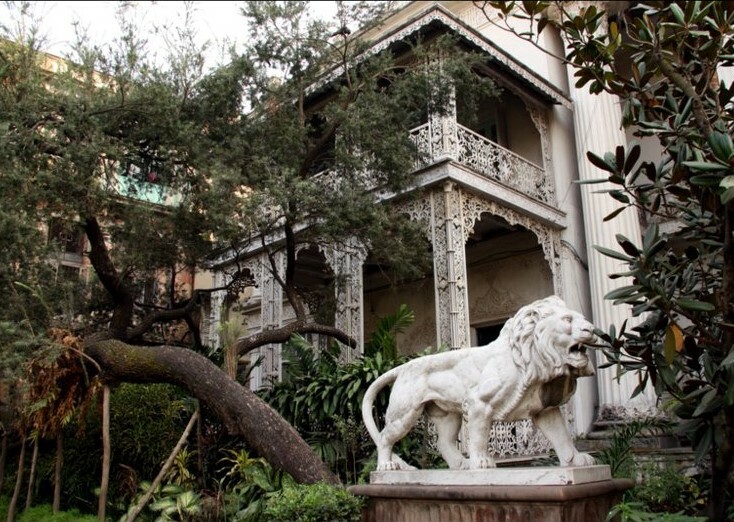 The mansion was designed by the famous bengali engineer Nilmoni Mitra . He had also designed six to seven other grand houses Bagbazaar , however his work in Basu bari is note worthy . Though the other great houses during that era featured European style but Basu Bari had gothic style with Mughal and Ancient Bengali influence . The palace has witnessed many life turning events including the Bengal partition movement along with prominent personalities of those times visiting or staying there. Sadly, the palace is in decay and with no maintenance. From the exterior , the magnificent ruined façade of Basu Bari is a sad reminder of its former opulent life and past glories. It is tough to imagine there was a large garden with fountains , a stable and even a zoo. Despite obvious pride in their heritage home, the Basus find it very tough maintaining such a large house , which has also forced the family to gift part of the house and many artefacts to the Kolkata Municipal Corporation. It’s a hope that these heritage treasures will be restored and maintained something that now seems impossible to achieve in private hands. In the next blog we will look into some more Rajbari who managed to keep up their stature and grandeur in the present times . Watch this space. In Goethe’s words “ A man does not learn to understand anything unless he loves it” and this my feeling for Calcutta . My love for this city in spite of its being unorganised, complacent and cluttered, has stimulated and motivated me with the love and warmth I received from various quarters. My new quest begins to discover some of the old areas of Calcutta where heritage houses and history fill every crowded lane and abandoned courtyards . Languishing in another time and place , at the end of narrow lanes and behind unkempt commercial establishments. 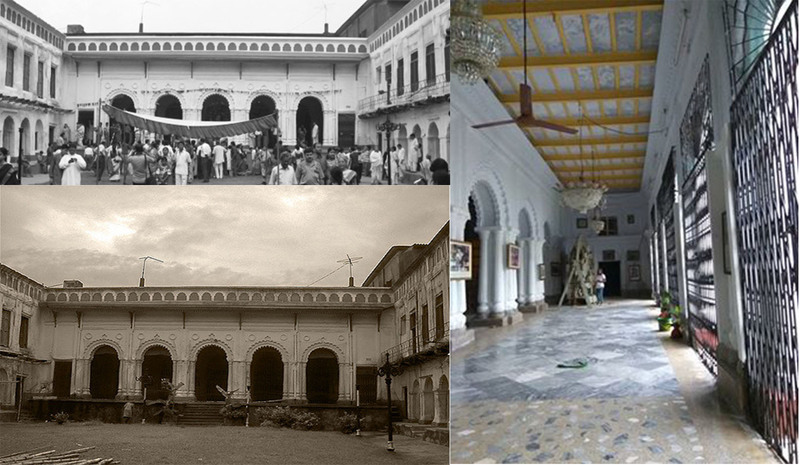 Calcutta’s rich heritage waits to uncover. 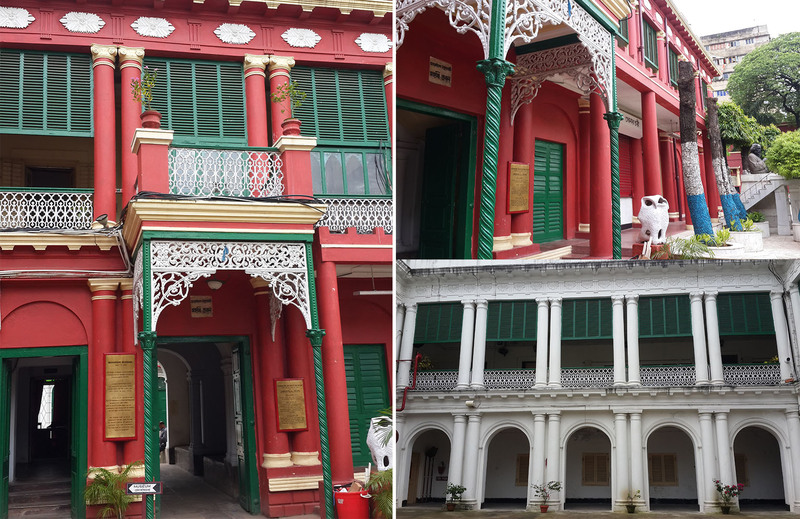 These great houses of Bengal’s merchant princes have been largely ignored, forgotten. Most of the interiors have remained the same for over 300 years but the exteriors look dilapidated . These families have experienced enormous changes in fortune over the centuries, from great wealth and power during colonial times to dramatic economic and social upheaval post independence. For the remaining, their ancestral homes are bitter sweet symbols & memories of family pride & prestige. Almost impossible to restore or sometimes even to maintain due to lack of resource, government grant or basic infrastructure. To understand this history, it’s imperative to reel back to 1690 the official birth year of “CALCUTTA”. Although many traders and weavers had settled in the area as early as 15th century, French and Dutch had started trading bases in Chandanagore and Chinsurah, it was the arrival of British Merchant Job Charnock made way to the birth of Calcutta . Bengal was very beneficial for trading base then for geographical reasons. What we now see as Calcutta was then made up of three village markets surrounded by jungles. 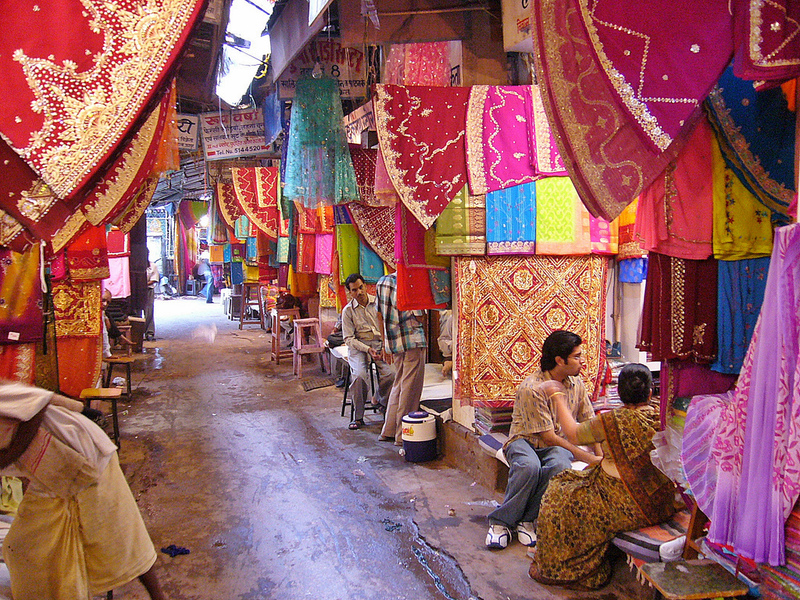 “Sutanati”- the thread market which was a prosperous markets for traders and weavers. “Govindapur” was fishing village and least recorded in the history is “Kalikata”. The city flourished and strengthened with British setting their base . 1757 was the year consolidation for the East India Company , which by then had began to function more as a colonial government and less as trading company. All Indians living in the area of Fort Williams were evicted which was earlier established by British to maintain their position by building a fort . As Bengal then was the wealthiest province in India and earlier mentioned conducive for a trading base, Calcutta also soon became the city of palaces . Owner of these palaces and mansions were landowners , zamindars, merchants or were at various positions in East India Company or the British Lords then like Lord Robert Clive & Lord Warren Hastings. These administrative men were significantly powerful to the British administration and this alliance was on the basis of their accumulation of wealth & position. With the British’s introduction of the Permanent Settlement Bill in 1793, they became even more wealthier and prosperous by buying up impoverished rural estates or zamindars and employing “Munshi” (Manager) to run them. Most of these owners were ‘Absentee landlords’ and the managers would run their estates for them and most were were cruel, shrewd and dishonest and hence the common man suffered. For these wealthy landowners , the countryside/ villages was forgotten and ignored, they never bothered to check the administration of these estates , for them the pleasures of growing metropolitan city of Calcutta beckoned. Some of these urban “Rajahs” had inherited the titles but most had titles conferred to them by the British. Not only did these titles gave them great prosperity but it also gave them power, influence and status . Famous families included names like Tagore, Mullicks, Dutts, Sens & Mitra are some of the examples . Although, presently their fortunes have declined drastically, many former aristocrats and famous personalities have lived in these ancestral homes of historic North Calcutta. These wealthy Indian merchant kings sought to display their wealth by associating with the rulers. As the colonial city of Calcutta evolved , mansions and palaces in North Calcutta began to appear increasingly hybrid with the addition of more European influences. In early 19th century some great economic and social changes influenced the style , architecture and lifestyles of these great houses even further. Amazed with these palaces and their heady mix of architectural styles there seem to exist in an irrepressible harmony . Neo –classical , Islamic & Hindu influence can be found in the structure of these buildings. Intricate archways & doorways wide enough for an elephant to pass through, lead to vast inner courtyards with temples of ancestral deities . The unique style of architectures in these palaces began to develop . These enormous houses where not only residences they were places of business, worship and opulent lifestyle . Many of these houses became infamous for their extravagant and slothful lifestyles. Calcutta still thrives with stories of these long gone wealthy residents. Their opulent lifestyles became to be known as ‘Babu Culture” a phenomenon exclusive to Calcutta. These babus were determined to spend their inherited wealth from their ancestors. They decorated their homes with chandeliers from Venice, mirrors from Belgium , crystals from France and furniture , paintings, sculptures & music boxes from England. The lavish lifestyles o and the competitiveness with which they displayed their wealth became the talk of the town. As time progressed their increasingly affected manners and wasteful lifestyles began to be mocked by British Associates as well. Things changed when the British moved their capital to Delhi. First city of India- Calcutta became secondary. Shocked and disappointed these great families began to looking for ways to re-establish their influential positions and blossoming independence movement seemed to be the answer . Babus where hanging to whatever there were left with and they chose independence from the very people who had empowered them to attain their wealth and positions. The final outcome was obviously bitter. However, after independence their situation changed even more dramatically . The British who had given them the power and wealth had gone and ironically many did not foresee how this would eventually effect their life . The zamidari system was abolished and became part of a new independent India. Their vast estates were gifted away to the new government. The compensation received to maintain these huges estates was not sufficient. It was the beginning of the end for a people who had no experience in dealing with everyday life . Not only did the great houses begin to decline, so did the area of North Calcutta . 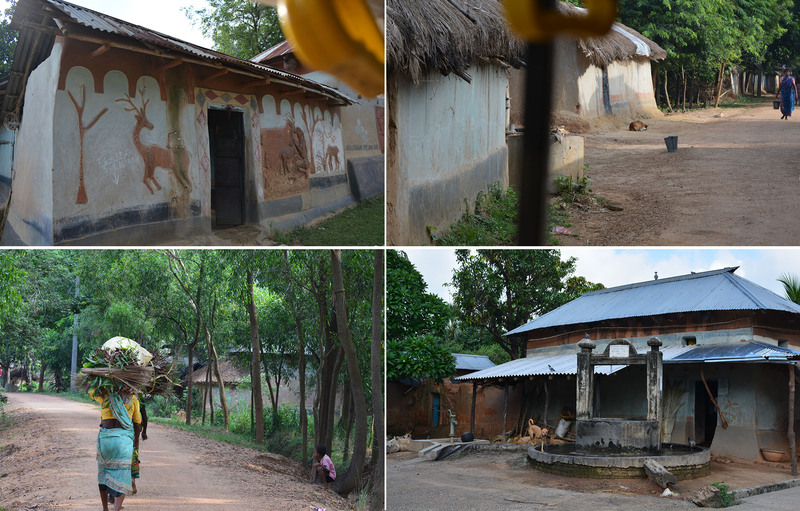 Nevertheless these ancestral homes remained, many families found they could not agree on what should be done with it . Impossible to restore or maintain , they often resorted to simply drawing straws on who should remain and who could move to the cleaner, quieter areas of Calcutta. Some family disputes have dragged on in the courts for decades while the ancestral home decayed and crumpled . One of the main reasons for the plight of many great houses today. On the contrary looking at the positive side many agreed to keep their houses by forming a trust which is mostly maintained by the eldest son of each family . In other cases families have leased or gifted spaces in their ancestral homes for much needed schools, research institutions or hospitals. Most of these properties are now rented out for movie shoots, daily soaps and used for their annual Durga Puja festival as well. Magnificent ruined mansions now sit alongside small residences , temples, bazaars and hutments abandoned by owners unable to sustain them . Many are hauntingly beautiful , to others they are an unwelcome reminder of Indian’s colonial aspirations and some are grand symbols of Bengal’s entrepreneurship and epitomise Calcutta’s past glory. In this series I intend to take you through long forgotten , locked in time mansions & palaces which had some rich heritage in past but now it stands as a mere reflection of glory of the past. Watch this space as I take along some of the prominent houses and properties which I can vouchfor looking at them will make you feel wish you were in that era. Imagine being presented with a cloth to wear, rough to touch, as simple and as raw as nature… in fact, tales whisper of it being magically woven by the hands of nature herself, as a gift to nature lovers, with hints of healing properties. 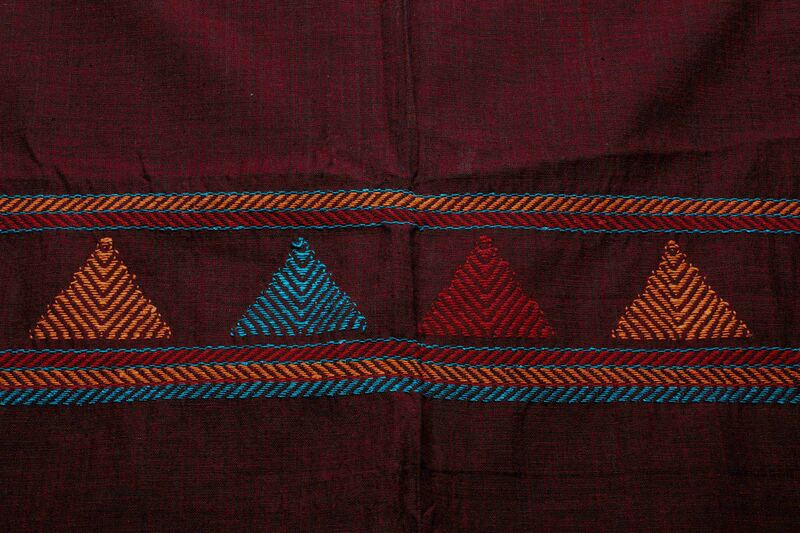 Being first worn by a tribal folk – forgotten, now remembered through this timeless fabric, made from a specific tree in a small district of Odisha, after which it is named – Kotpad. 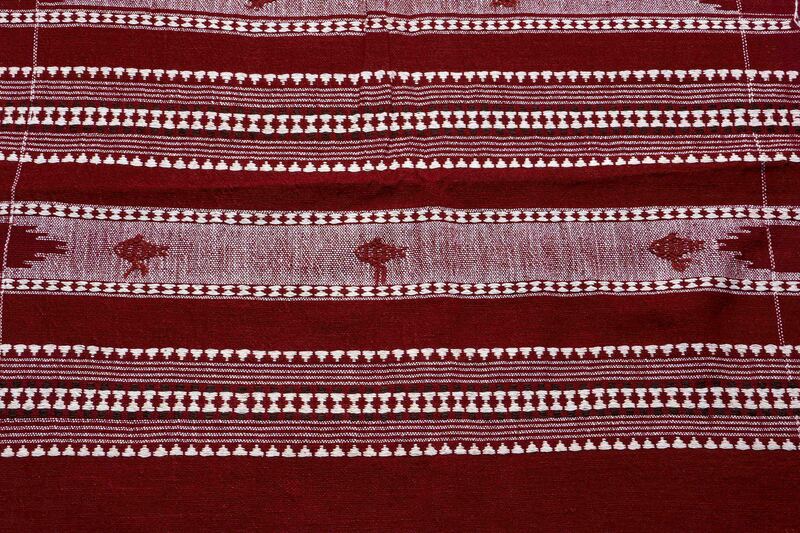 For those looking to go green, live organic and at the same time don authentic cultural art, set your gaze upon Kotpad handloom fabrics, the first item from the state of Orissa – to receive the ‘Geographical Indication of India’ tag. Simple, but with a raw grandness that befits a true union between nature derived materials and handcraft, this organic dyed textile is found fashioned into traditional saris, as well as dupattas, stoles and other contemporary products. 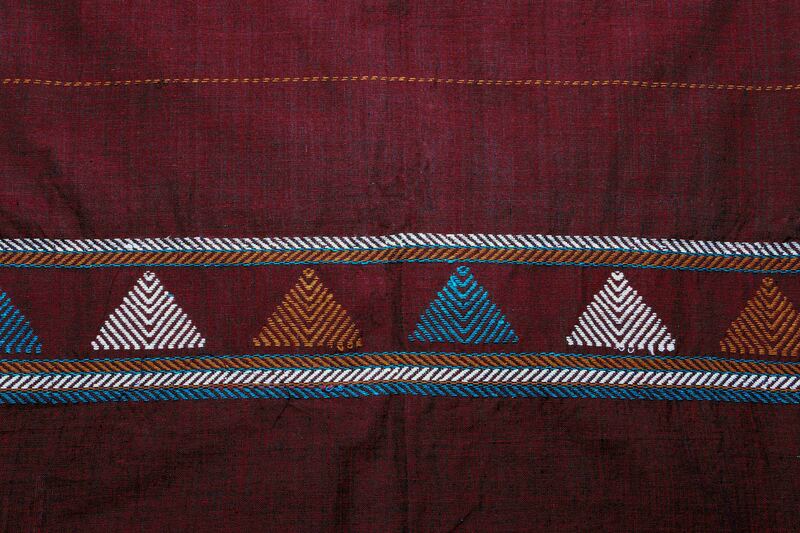 Being a tribal invention made for self-use, Kotpad weaves were discovered and popularized in the 80s, and is credited today to Orissa’s Mirgan community of Kotpad village, Koraput district. This organic handloom antiquity is a vegetable-dyed fabric manufactured from the Indian Madder (Aal) tree, which grows in Koraput district. Non-synthetic, non-toxic and eco-friendly, you can wear a Kotpad weave – free of fearing any harm to your skin and with an invigorating sense of rustic authenticity. This knowledge and use of vegetable and mineral dyes goes back to pre-historic times in India, and it is now fighting a modern battle of quality vs quantity against chemically-dyed products, which are less labour intensive. While there are said to be around 300 dye-yielding plants in India, post the advent of chemical colors flooding the markets, most of these plants stuck to producing popular natural dyes such as Indigo, but the craft of Kotpad weaving still lives on, staying true to nature and its origins. HOW IS A KOTPAD WEAVE MADE? 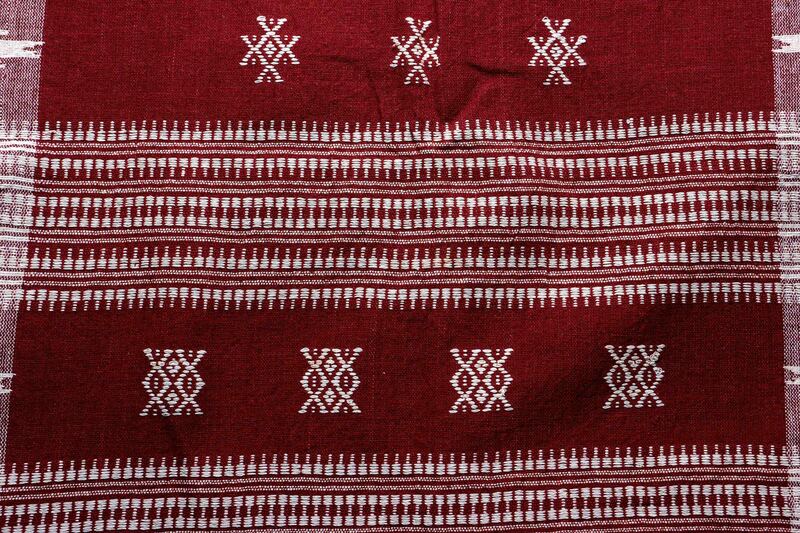 The tribal Kotpad weave is traditionally woven in heavy cotton. The process for hand-weaving Kotpad fabrics is elaborate and can take up to a month for maximum quality. Procured from Aal trees in the jungles of Koraput district, the root dye is naturally processed and the cotton yarn is laboriously treated with dung, wood ash and castor oil. Woven in pit looms with extra weft patterning, the dyed rough cotton yarn is decorated with intricate motifs and treated to a solid border effect on the fabric, using a multi-shuttle interlocking patterning, which allows for innumerable combinations in scale and volume. However, only one saree of a particular type can be woven once the loom is set. Kotpad saris are perhaps the most popular and most complex product of Kotpad weaves, typically rich in fabric and minimal in design. Yet being a tribal invention, traditionally – Kotpad saris weren’t often woven without symbolic significance, being more elaborate in its make and design when made for occasions such as weddings, yet more simplistically made to mark the rites of passage in a woman’s life, or to indicate the identity of the wearer and their standing. Initially handmade as short length saris, weavers expanded operations to include full-length cotton saris, dupattas, kurtas and other contemporary products, after gaining nation-wide popularity. For men Kotpad weaves are fashioned into Gumchas – traditional coarse cotton cloths, used as towels and sweat cloths, worn as headscarves. 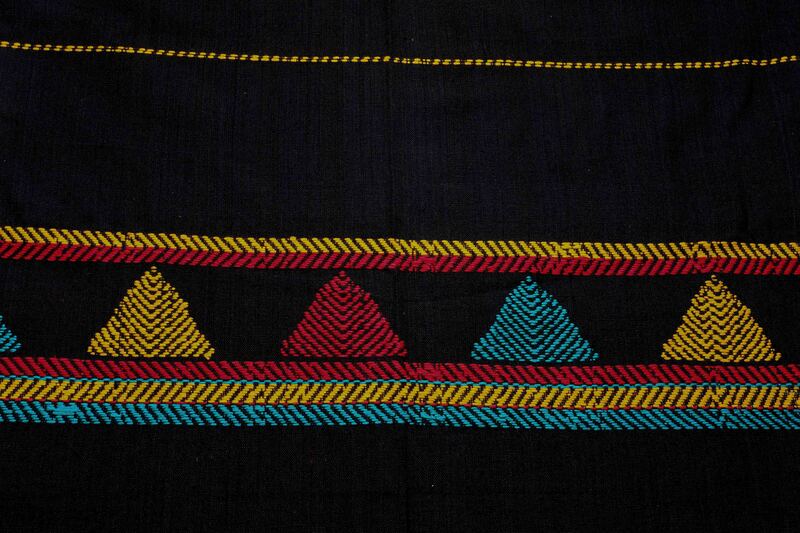 They are also made to be worn as Tuvals, or knee-length lower garments with border designs and decorative motifs. The colours of Kotpad fabric, which resonate an earthly grandeur, are limited to the nature of the tree its uniqueness and vegetable-dyes are derived from. Depending on the age of the root bark and proportion of dye used, colours range from deep maroon to dark brown. For added effect, the original colours are mixed with the natural unbleached off-white of the cotton yarn.Traditionally, they used to weave sarees which were narrower than the existing sarees, made of heavy thick unbleached cotton with a single color pattern woven in red, purple or brown, which were then dyed with the distinctive dye made from the roots of the Madder. While Kotpad weaves have evolved to include many new modern day products, the varying motifs that each authentic Kotpad product embodies, religiously maintains the traditional tribal art and iconography, which visually represent the way of life the art has originated from. Kotpad motifs typically include depictions of traditional patterns, tools, professions, native animals, huts etc. In particular, if you were to look for a distinctive motif, popular among Kotpad weaves, you should find a pyramidal pattern called the ‘phool (flower), cheeta (leopard), chauk (seat). It is important to note that these motifs have been passed down from generation to generation. To wear a Kotpad weave today – is to know that you wear a tradition that was intimately first created for self-use, humbly hidden amidst tribal life. It was Government exhibitions and fares that led to its nation-wide recognition and demand to be implemented in a variety of products. Yet, in the face of a now nearly synthetic – modern world, which favours speed and volume, many among the new generation of weavers are shifting towards less time-consuming and more rewarding professions. Nonetheless, as befits the timeless handcraft – there are still tribes that are persistently keeping the craft of Kotpad weaving alive, albeit at great difficulty, adapting their designs to match contemporary urban market preferences, while sticking to tradition. And so to wear a Kotpad weave today, is to also know that you’re not just wearing one of India’s finest organically dyed fabrics, but that you’re adorning a cloth that embodies simplicity at its best, with a storied past – spun from nature. Note: In the pursuit to discover & revive authentic traditional handcrafted clothing, accessories and lifestyle products that I believe to be timelessly fashionable, Advaya Tales is now travelling to different parts of India to source products from their roots. This blog cover the 2nd part of my journey through Bengal . where I lost myself exploring the wonderous City of Joy – Kolkata. Confronted with today’s generation – the “Kewl” kind, who regard everyone as “dudes” and are overly concerned with being “cool”, seldom do I find the past being credited with fond reminiscence in favour of rushing in to the future. My generation on the other hand, is a transitional one which hangs in the midst of the old and new, most of us misfits to the happenings around us today. Little did I know that an accidental back-packing tour to Bengal and its City of Joy, would have me discover a place that was stuck in a similar generational time-warp, between the old and new. This mirrored relation of circumstance, helped me form an instant bond with the city and drew me in to explore it in its entirety – by every road, every wall, and every structure – with a growing passion. It was a calling that would reintroduce me to my roots, my tradition and a culture that so many – today – are heedless to. Exploring Kolkata or Calcutta (for the undeniable British heritage inhabiting it) is a wondrous experience, which involves wandering along the city’s ghats, cutting through its endless narrow lanes, trudging through its busy streets and finding people gathering up every nook and corner for a cup of tea. It’s no secret – Bengalis love their tea! From official meetings to gossip sessions, it is indispensable for them in any gathering, especially at their “Addas” – meeting spots where intellectual ideas are exchanged (which famous filmmaker Satyajit Ray relates to open dialogues during the times of Socrates or Plato). 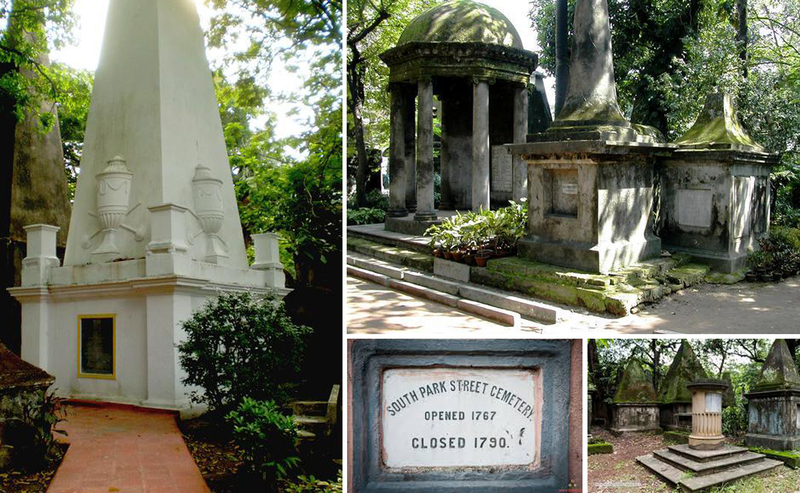 Among the oldest colonial (Non-church) cemeteries in the world, founded in 1767, it is now a heritage site preserved by the Archaeological Survey of India. The North Park cemetery was opened by 1840. I was spell bound by the Gothic structures and tombs inside, which mainly also betrayed a strong influence of Greek, European, Pan-Asian architecture. 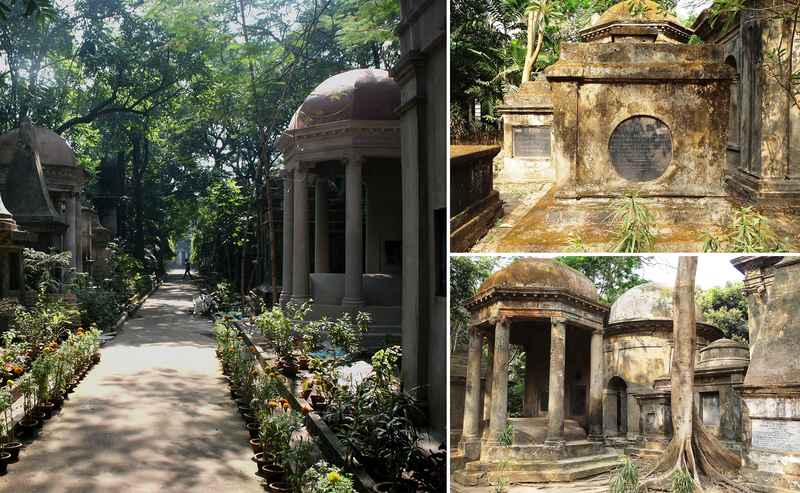 It is the resting place of many notable personalities, the prominent and biggest ones (also the best maintained) included Sir William Jones – the founder of Asiatic Society, Henry Louis Vivian Derozio – pioneer of the Young Bengal Movement and famous poet – Rose Almer. This necropolis which was built for the East India Company is full of obelisks, sarcophagi and Mausoleums, which hint at a deep Egyptian and Romance influence. While the cemetery is home to many graves, sadly most of these are in ruins and I consider it a sacrilege that the area is misused by modelling shoots or lovers finding solace. Upon closely inspecting the graves I discovered that many had died at an early age, which I speculate was due to the lack of treatment, incurable disease, famine and plague prevalent at the time. Despite being rumoured to be haunted, the place never felt spooky at all, rather it rung with an unworldly silence orchestrated by thousands of stories sung by each grave, to every passer-by. I couldn’t help but feel like here was truly – a place of lost souls (which ghosts are known to be). I’ll always remember South Park Cemetery as a place that filled me with an unforgettable deep sense of nostalgia and timelessness, which was unlike anything I’ve ever felt. Another great place to unearth the rich history of Calcutta and relive its old memories is the National library, once the centre of administration of Warren Hastings (first Governor of Fort William, Bengal, defacto governor general of India from 1773 – 1785). The tall pillars and wide corridors still laid some traces of history. I could feel that era like it was yesterday, as the library’s solid wooden doors leading to the interiors excitedly squealed summaries of summers past. Also – for a place that stories have claimed to be haunted, the only thing I found horrific was an otherwise unusual place, having acres of land left unattended and unmaintained. A bit further down was the new building of the national library, perfect for people who could dive into books for hours, days or months, or for people pursuing further education, scholars & researchers. I could have easily spent an entire day reading the rare collection of books available here, and I silently thanked my parents for not restricting me to one language, as I appreciated and identified many great Bangla books, which may never translate to English. An 18th century white marble palatial mansion standing, as a forgotten treasure house, amidst the dingy lanes of North Calcutta. 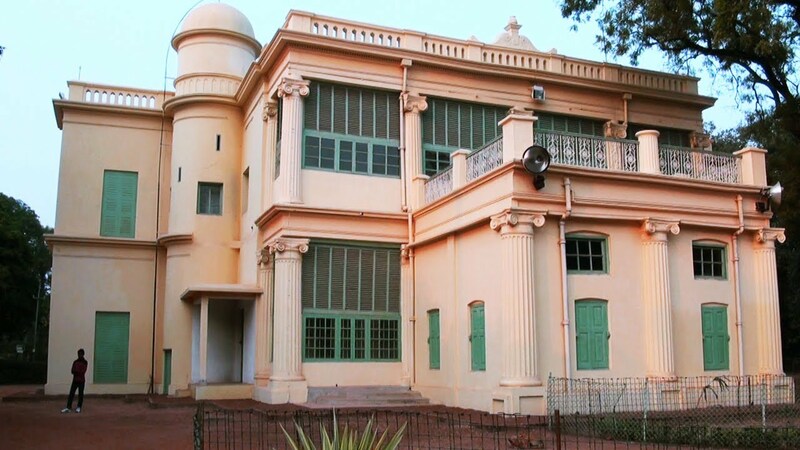 Raja Rajendra Mullick, the contemporary of Prince Dwarakanath Tagore, had built this palatial mansion in 1835 by commissioning a French architect. Lord Minto, a British appointed Viceroy, gave the palace its name for its grandeur and fame, now – 180 years later – nearly faded into obliviousness. 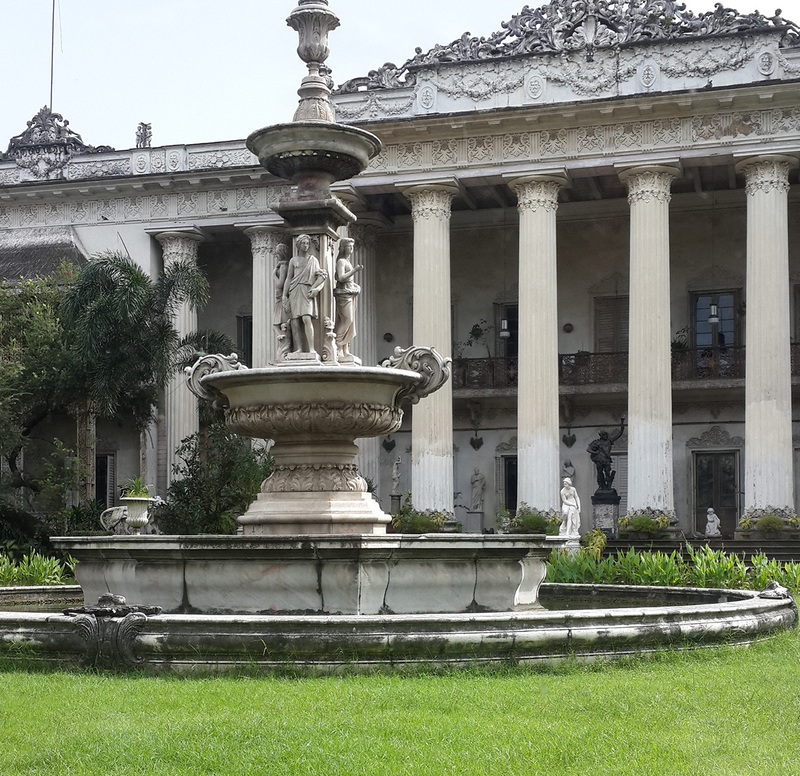 Though I found the Marble Palace sadly side-lined by a lot of Kolkatians, many foreign tourists throng to it to fully comprehend Kolkata’s celebrated past. The name Marble palace sounds more apt when you come to know that 126 different types of imported Italian marbles were used to build the mansion, its floors and the walls. The gigantic engraved façade and tall Corinthian pillars of the building stands the test of the highest standards of neo-classical architectural structures of Europe. As you enter the subsequent rooms, the sheer number of artefacts, statues, furniture and paintings will leave you overwhelmed, especially considering that it all belongs to a personal collection. 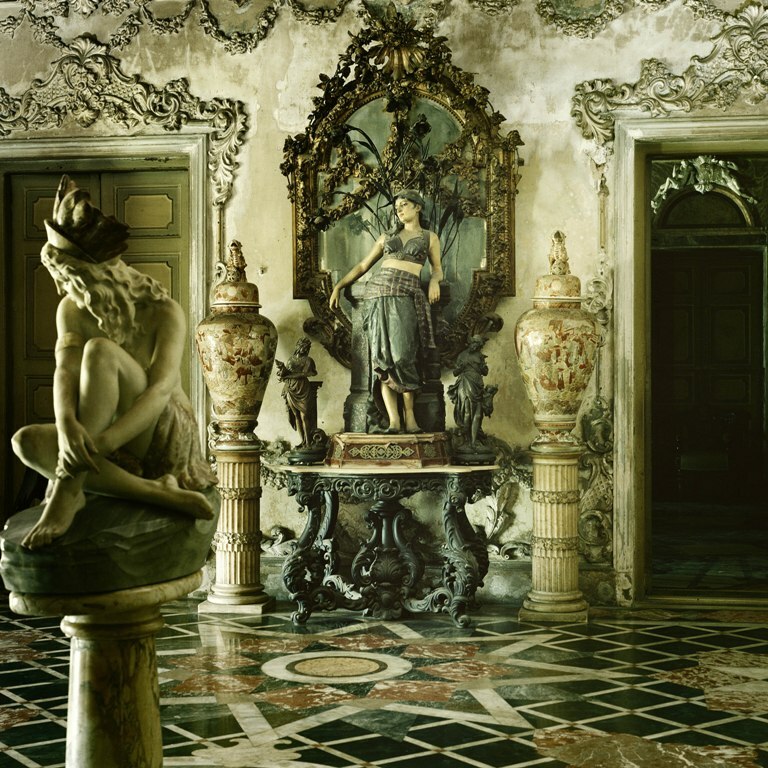 The Raja’s taste for art and sculpture pegs him as a 19th century – rich and eccentric – art connoisseur. The statues and other sculptures here are a fine medley of Greek, Roman and Indian mythology, many of which are imported from beyond the seas and some which the Raja probably received as gift. In particular, one room stands out containing an awe-inspiring, larger than life statue of Queen Victoria, carved out of a single tree trunk. A winding wooden staircase leads to the upper stories of the building where the descendants of the Raja still continue to live. This quarter is off-limits to the common visitors but the rest of the section of the three storied building has been converted to a museum. There is also one private Jagganath Temple inside where visitors are not allowed. Large halls and corridors bursting with busts of historical and mythological figures, with a lavish spread of Chinese and Japanese porcelain vases, stand impressively. Wall sized mirrors in some of the rooms and many other original Belgian glass mirrors baroquely enclosed in gold polished frame, dazzle the eye. The palace contains a collection of some rare original paintings of European stalwarts like Rubens, Sir Joshua Reynolds, Titian, Murillo, and John Opie and our own Ravi Raj Verma. From the surrounding verandahs, the wide courtyard in the middle of the house is visible. It comprises of a traditional Bengali Thakur dalan (corridor) – which is a curious blend of Indian culture and Western style. The sloping roofs are indicative of Chinese influence. A lawn in the exteriors contains a pond with a beautifully engraved stone fountain in the middle, which unfortunately does not spout water anymore. The entire garden is inhabited with stone statues of lions, fallen angels, Buddha etc. interspersed with marble top tables and benches. The palace also boasts of hosting the first private zoo in India started by Raja Rajendra Mullick. Sadly not much of the zoo now remains, except a few exotic birds brought from all over the world like – Toucan, pelican, Hornbills, peacock, pheasants etc. singing of past glories. There is also a dilapidated rock garden beside the zoo, sadly desolate. With a little renovation and maintenance, the Marble Palace can shake off its dust and be a golden testimony to Calcutta’s ‘marvellous’ past. One of the most talked about places in Kolkata, the “Ahiritola Putul Bari” (Doll’s House) is heavily rumoured to be haunted, just as were my visits to – South Park Cemetery, the National Library and Jorasankho. Nonetheless, the Ghostbuster in me entered it with all the more determination, to discover if the rumours were indeed unsubstantiated in the case of the Putul Bari as well. The ‘Doll’s House’ is owned by the Natta Family or Natta Jatra Company, pioneers of most successful Jatra (Bengali Folk Theatre) of West Bengal. Founded since the 19th century Barishal, Bangladesh, it started off as extremely popular with the poor literal rural audience. Yet, it was in the 60s and 70s that their plays became extremely popular. A lavish palace which was once witness to carnivals and festivities, Putul Bari is home to a 150 year old art form, currently in its fifth generation. 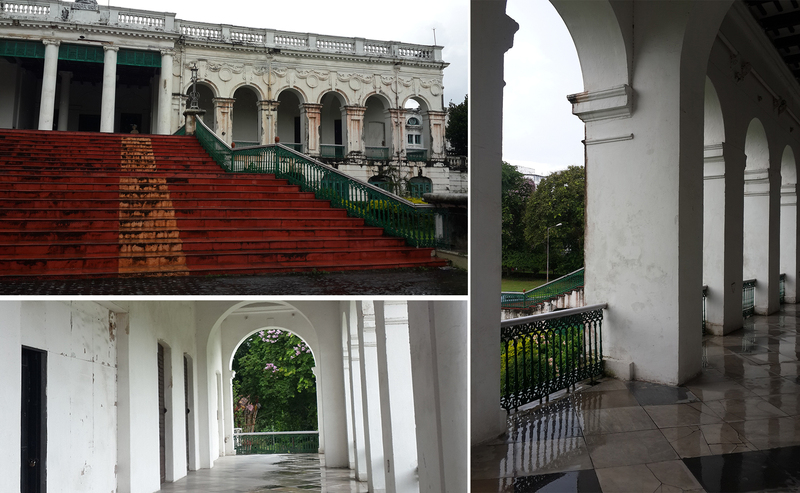 The mere resonation of the once oozing grandeur of Putul Bari is what I believe to be the charm of the place. This of course has been blatantly misunderstood as paranormal and the human addiction to drama is all that substantiates the rumours. Currently in a dilapidated state and barely maintained, it is still declared a Heritage site which attracts a lot of visitors on the basis of its so-called “hauntings”. Shobha Bazar Rajbari, North Calcutta, known for its grandeur in celebrating the Durga Puja every year, was built by Maharaja Nabakrishna Deb matching much to his taste for pomp and grandeur. He started the Durga Puja in 1757, to set a fashion and status symbol amongst the elite class of society. The number of Englishmen visiting the Family Durga Puja, particularly made it a prestigious affair, or so it seemed…In truth – religious scruples fell by the wayside, as Englishmen attending the dance-parties dined on beef and ham and drank till heart’s content. 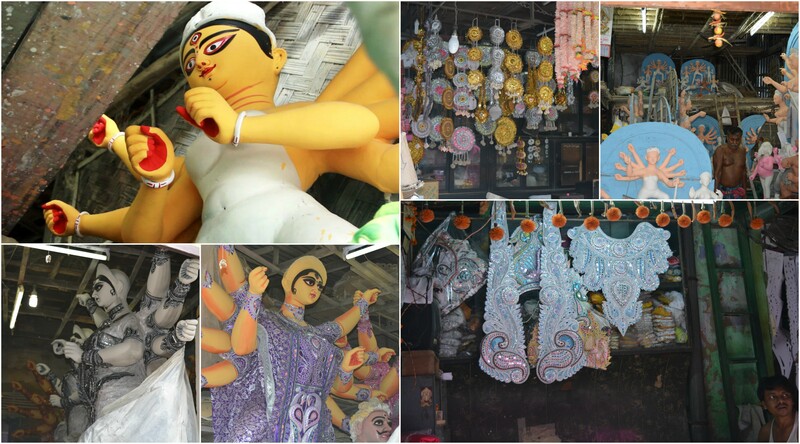 The Shobhabazar Durga Puja is split into two houses opposite to each other, but both the Pujas continue with their characteristic distinctions. The deity Kartik is dressed in breaches worn by Englishmen and as in most Bengali pujas Ganesh wears the traditional “dhuti’. 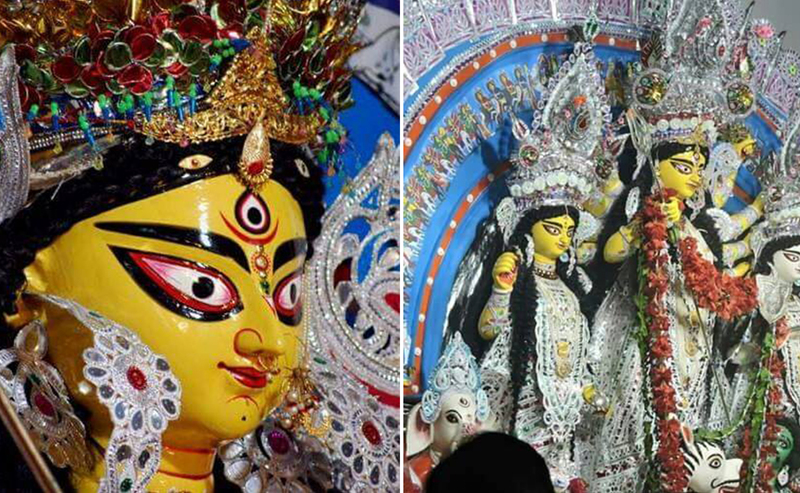 But at Shobhabazar he is an idol worshipped by Marwari ancestors, while the Goddess Durga wears jewellery designed by the Mughals or the Nawabs. In earlier days Famous “Kabials” (religious Singers) like Anthony Firingee (Hensmen Anthony) and Bhola Moira contested for attention with the nautch girls here. For the past 250 years, generations of traditional confectioners from Bardhaman come down to the here and make lip-smacking delicacies. 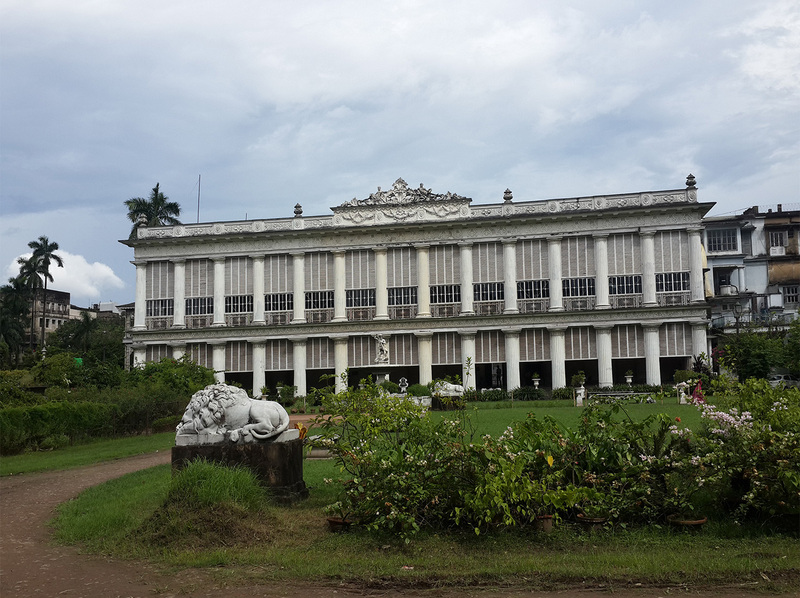 To my dismay the heritage mansion and its legacy is in a sad state of non-maintenance, though the interiors speaks volumes about the grandeur and sophistication of people visiting and staying back in history. 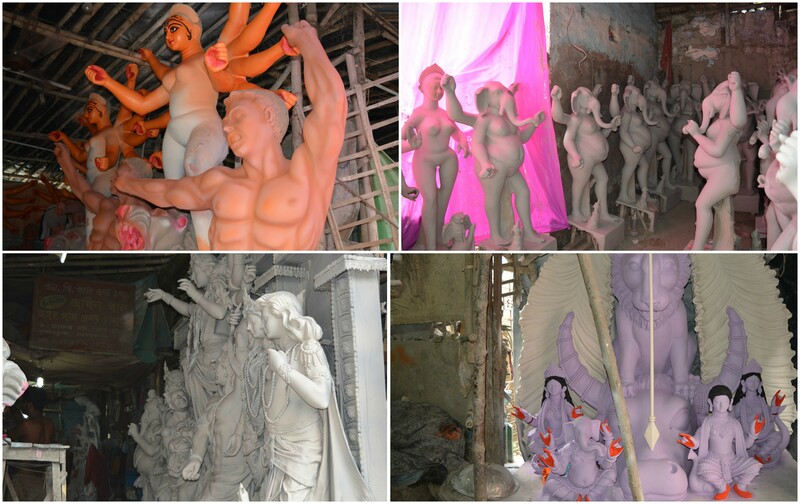 A journey through the narrow lanes of North Calcutta, led to a place commonly known as the potter’s area, where every year the Goddess Durga begins her journey to every part of the world for the annual Durga Puja. It started around 300 years back when the potters migrated from a place called Krishnanagar. Kumortuli is situated on the banks of Bagbazar Ghat, where the clay from the nearing river can be procured easily for the potters that stay there weeks before the Durga Puja festival, to create idols for the Zamindars at their thakurdalans (demarcated areas for religious festivals inside the zamindar’s residence). During the partition of Bengal in 1905, highly skilled artisans from Bangladesh from Dhaka, Birkampur, Faridpur – made their way to Kumartuli. Post-Independence the abolishment of Zamindari System made the sarbojonin, or community puja, popular. This is when the Goddess moved out of the cramped thakurdalans to the wide pandals on the roads. Sitting on the banks of the Hooghly near the Shobha Bazar Jetty in the afternoon, with a soothing breeze to give me respite from the sweltering heat, I remember being lost in a pleasant yet melancholic contemplation which summarized my explorations. I couldn’t help but wonder how today with changing times the glorious history of this place has been misinterpreted and ignored, I deeply pondered on how a place which was once the most celebrated places that burned so brightly, now stood with its glory so dimmed. A strange sense of similarity which struck me in all the places I visited was how history had become history, with glorious years of the past written off as hauntings of the present. I do fondly recall that my trip to the “city of Joy” ended on a joyous note, as I transitioned from history explorer to girlishly wandering into the crowded streets of Gariahat market & Dakshinapan Shopping Centre, any tourist or locals’ delight for shopping, where many handicraft and textiles emporiums of government can also be seen. A huge number of jewellery (imitation or precious) shops are also located here. With some last minute tidbit shopping and hogging – my Calcutta escapade came to an end, as a journey worth cherishing and remembering, at this place which I’ll keep wishing to come back to in order to explore and discover more of its forgotten history. Note: As promised in our last blog about our visit to Jaipur, Advaya Tales is back with lots of stories and historical explorations from a long trip to Kolkata, the City of Joy. Yet I find no better way to begin describe my findings, other than by first recounting the history of the name – whose timeless writings, poems, songs and stories – the glories of Bengal are remembered by, i.e. Rabindranath Tagore – the Bard of Bengal himself. 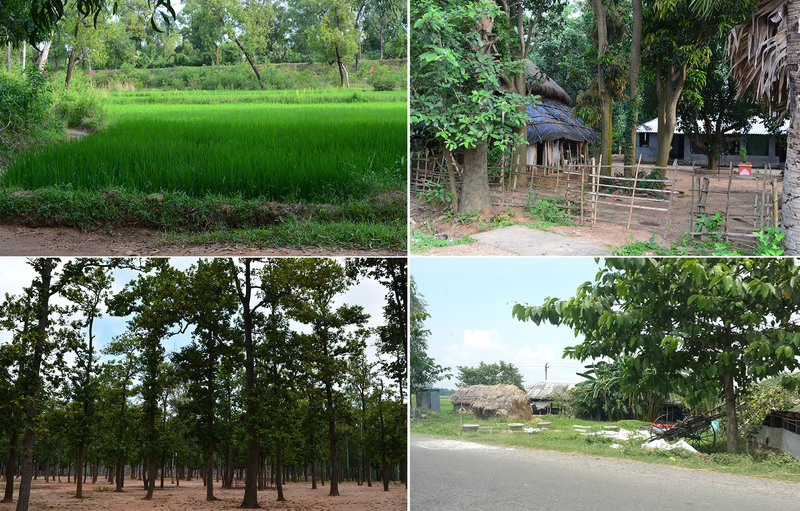 While my next blog describes the many other places that define Bengal, this blog explores Tagore’s legacy, Shantiniketan & the rural paradise he grew up in. The story of Bhubandanga’s transformation, from being named after a local dacoit – Bhuban Dakat, to being named an Abode of Peace, goes back to 1862. It is said that Maharshi Devendranath Tagore (Rabindranath Tagore’s father) while on a boat journey to Raipur, came across a landscape with red soil and meadows of lush green paddy fields. Rows of chhatim trees (commonly known as the Devil tree) and date palms charmed him. He stopped to look, decided to plant more saplings and built a small house. 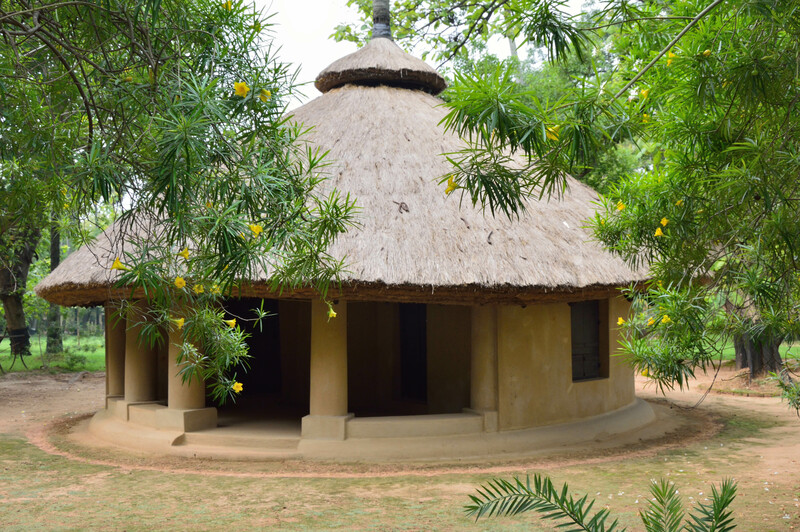 He called his home Shantiniketan (abode of peace). Shantiniketan became a spiritual centre where people from all religions were invited to join for meditation and prayers. He founded an ‘Ashram’ here in 1863 and being a deeply religious man, became the re-initiator of the Brahmo Samaj (formed in 1843). The Bramho Sabha, started by Raja Ram Mohan Roy, had fallen away from its original practice and aiming to revive it, Devandranath Tagore merged his Tattwabodhini Sabha with the Brahmo Sabha. 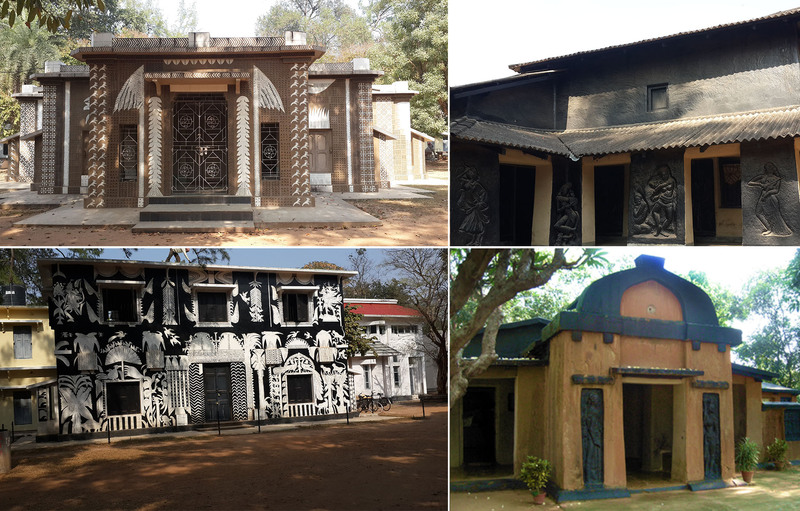 Shantiniketan today is a town situated near Bolpur, a tribal area well known for its handicrafts, remembered as a place where music flows and where the famous Rabindranath Tagore spent his precious years preaching love, music and life without measure. Home to the world famous Biswa Bharti University, which is surrounded by a large wooded area, densely populated with Eucalyptus trees and other trees commonly known as “Shalbon”, recognized by their big leaves. The plentiful flora and fauna of this place has for years given shade, solace and inspiration to many budding writers and creative minds. 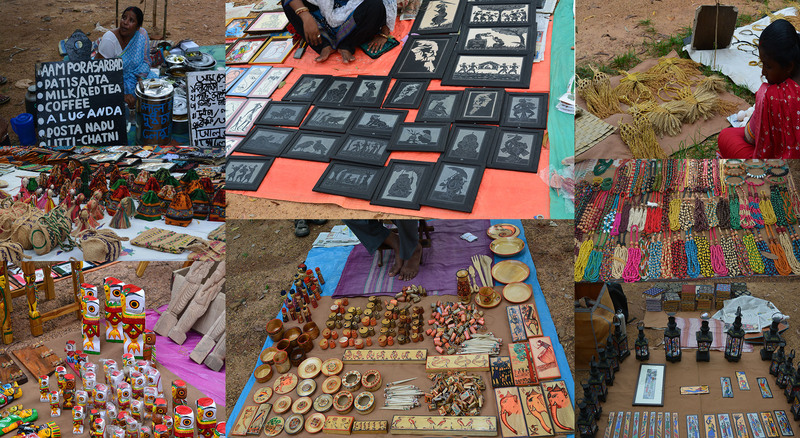 Exploring the landscape and people that inspired the Nobel Laureate, led me to one of the area’s main highlights – the Saturday Tribal Haat, commonly known as Shonajhuri haat, which takes place near the Kopai River. Popularly known as Khoai, immortalized as having deeply inspired Tagore’s poetry, the area around the river has red soil that forms ravines on the river bank with weathering. 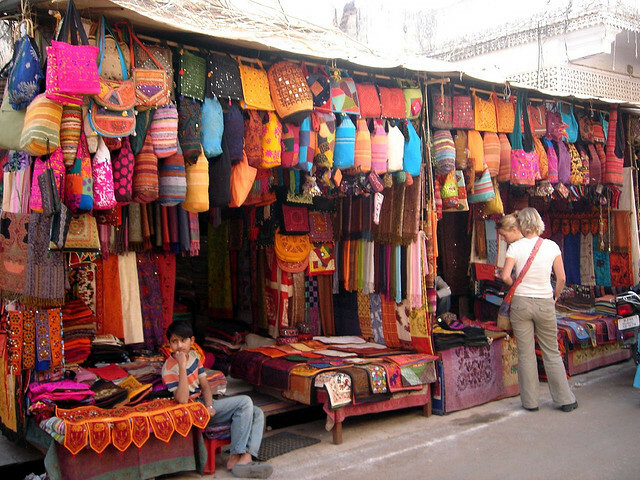 The Haat is a gathering for the local tribal folk to sell their hand-made products. These are hardworking people that make their living through their handicrafts and jewelry made from natural produce like seeds, flowers, leaves. The surrounding greenery teaming with the tribal song and dance during the Haat left me tapping my feet spell bound. Dusky beauties with their tribal jewelry, balancing a pot of water on their head looked so graceful and mesmerizing. Conversations with them revealed that while they were happy to ply they’re art to earn a living, there have been many instances where they have been duped, their products bought with promises of huge business, which never materialized. Nonetheless, a clear blue sky, lush green fields awaiting harvest next season and women selling local delights made in the village, made visiting the Haat a pleasant treat to the senses. – Rabindranath Tagore, ‘Kopai’, Rachanavali, VIII, 234. Unexpectedly chancing upon the nearing tribal village, I decided to explore. Picture – mud thatched roofs, woman carrying pots of water on their head, while the men readied themselves for work even on a Sunday. “They hunt for small fishes using their clothes as nets. Beyond the imaginations of most city bred folk, here was life which didn’t run on electricity, where food was cooked in the traditional “chulla” with fire and coal, where water had to be carried home from a nearby source, or where water for bath meant a dive in the pond nearby – if not the famous “Khowai” river, with folk music always playing in the background from most houses. So like a true Bengali on the quest for good food, I was treated with some amazing local recipes. The local market was buzzing with students and local eateries. While perusing through commercial crafts in the local markets, did not yield products that could be deemed value for money – in terms of quality, I was well compensated with the must-have “khullad” tea. Served in an earthen vessel, it came accompanied by a strange aroma, pouring forth nostalgic memories of my childhood holidays spent travelling. Yet, roaming in the Biswa Bharti Campus on a full moon night had its own charm, which once again left me reminiscent of my long IIT campus walks back in Delhi. It was as though the city and I were relating life stories, as I strolled on, as it revealed small dimly lit row houses which reflected a style of living, nearly forgotten. The moonlight glistening off the tall trees, swaying with every little breeze left me convinced that I need to spend more days here. 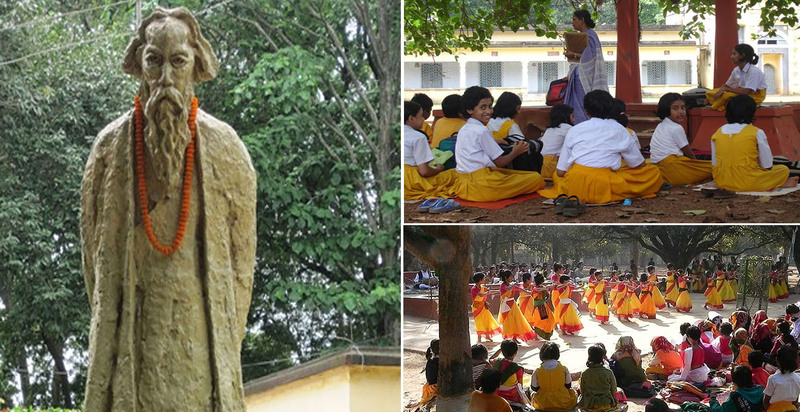 Started years later by Rabindranath Tagore in Shantinketan, the Patha Bhavana was the school of his ideals, where the central premise is that learning in a natural environment would be more enjoyable and fruitful. After he received the Nobel Prize (1913), the school was expanded into a university in 1921 and by 1951, it had become one of India’s central universities. Throughout the year this premise is buzzing with social and cultural events like Basanta Utsav (Holi), Barsha Mangal, Sharodutsav (Durga Puja), Nandan Mela (art fair), Poush Mela (Harvest Festival), Magh Mela, Rabindra Jayanti etc. The Poush Mela in particular is the prime attraction, being a three day fair (end of December) with various artists, singers, dancers and traditional Baul taking the centre stage. Jorasanko Thakurbari, aka House of Thakur’s, built by Prince Dwarkanath Tagore (grandfather of Rabindranath Tagore) in the 18th century, is situated at the Rabindra Bharti University Campus, North Calcutta. 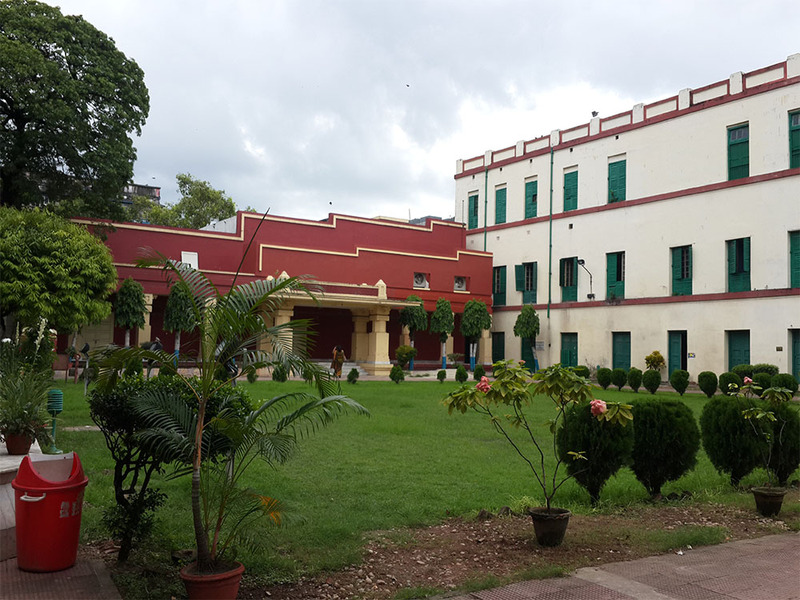 This is the house where Rabindranath Tagore was born, and the campus comprises of the residence of Tagore and the university. The house feels nothing short of time travelling into the history and the lives of the Tagores. The house gives you a glimpse into Tagore’s life, from his immeasurable personal and other contributions to the society. It’s interesting to know that apart from his literary contribution to his love for music, dance and so many other creative works, a deep passion for food walked side by side. Tales sing praise till date – about the “Thakurbarir Ranna” recipes specially made for the Tagore’s household. Most of these recipes are now lost to current generations, so like many other Bengali’s, I too had to depart with only fanciful wishes to feed my desire, to taste this food of legend. India may have immortalized Tagore by making his song its National Anthem, but Bengal has chosen to be defined by his music, his poetry and his way of life. Till date, Tagore remains alive not just in his life’s works but most importantly in passionate conversations over tea, especially at the Adda’s – that Bengali’s are so famous for. 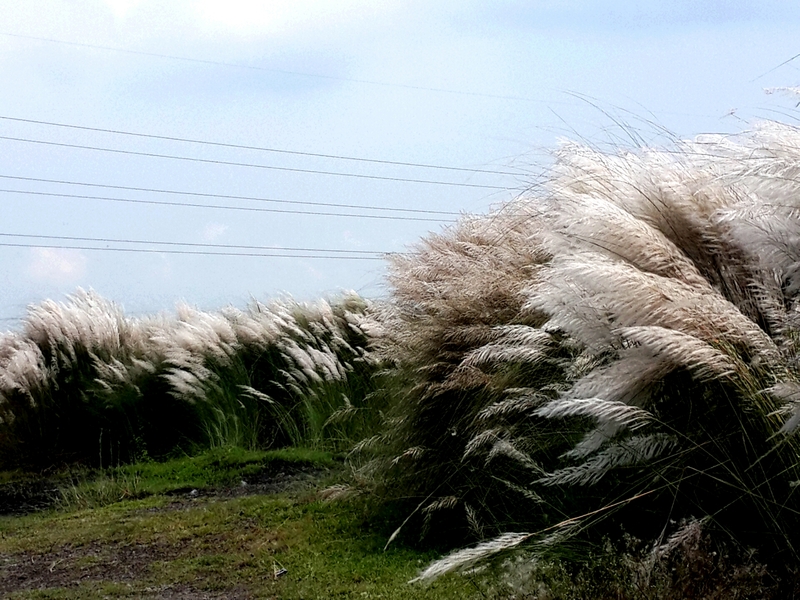 One cannot explore Bengal, without understanding Tagore. 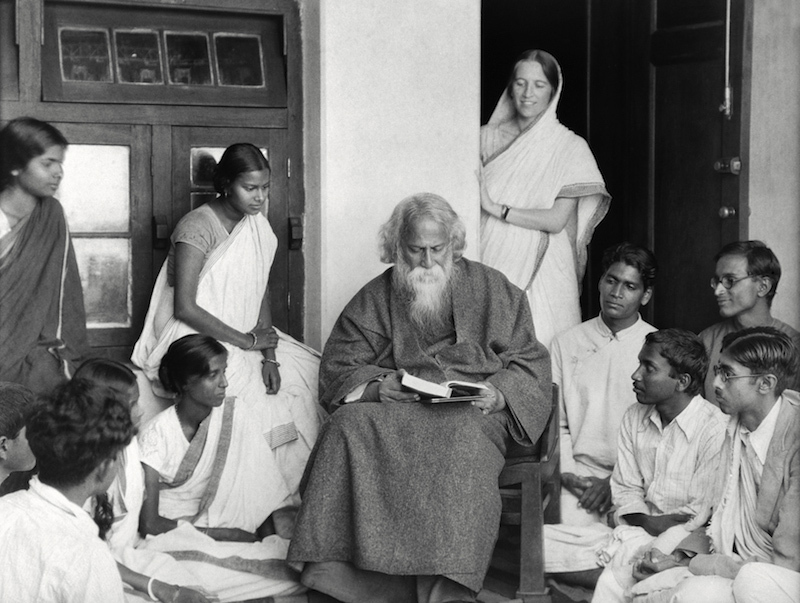 Rabindranath Tagore and Students, Santiniketan, 1929. So, having paid homage like a true ‘Bangali’ – by visiting and experiencing the legacy of Rabindranath Tagore, I set out with renewed excitement and vigor to explore the ‘City of Joy’ and discover its forgotten history. Stay tuned for Part 2 of the Bengal Diaries blog! Note: In the pursuit to discover & revive authentic traditional handcrafted clothing, accessories and lifestyle products that Advaya believes to be timelessly fashionable, Advaya Tales is now travelling to different parts of India to source products from their roots. 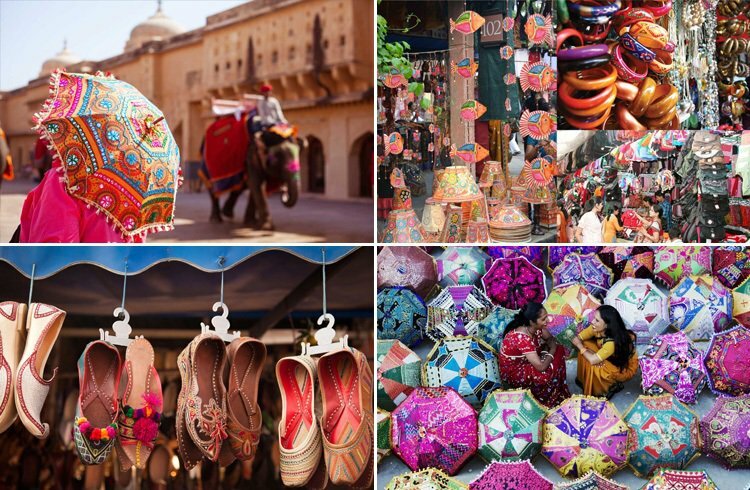 In the last blog I spoke in detail about a pit-stop at the city’s legendary – Amer Fort, and now finally getting down to business – I present this Travelogue to share my eye-opening accounts of my escapade through the markets of Jaipur, hunting for the city’s authentic distinctive crafts. Jaipur has always fascinated me. Though I have travelled there couple of times prior, the longing to come back never ceases to amaze me. The city’s distinct Havelis, sprawling Bazaars and legendary forts, still tell of tales a-fresh from ages ago. The Bandhanis, the Leheriya Dupattas, the Jhumkas, with pounds of silver jewellery on shining women with Kohled eyes, fills me with a deep reminiscent nostalgia that makes me feel a part of the city’s history. 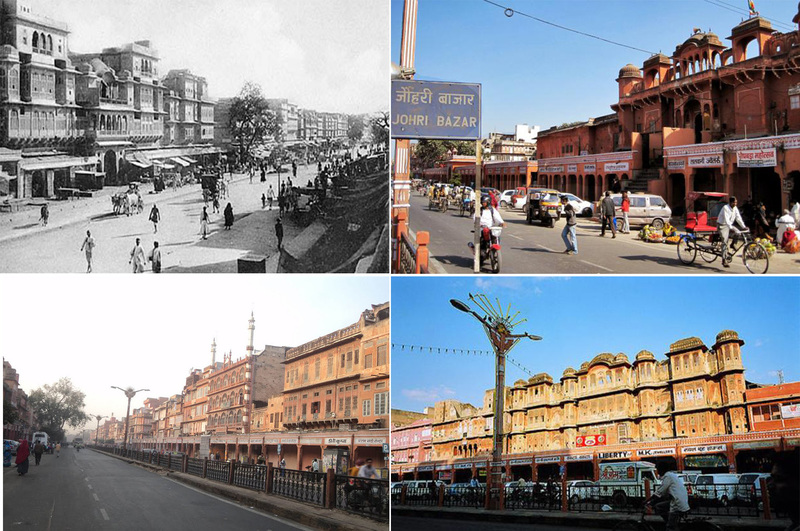 Indeed, the historical reminiscence when wandering through India’s ‘Pink City’ is furthered, as you visit its sprawling local bazaars placed in age old crumbling structures. However, on hindsight the sceptic in me wonders if this is a sign that the city is yet to develop and meet the challenges of modern trends and fashions. I personally believe, and our philosophy at Advaya Tales is – that cultural trends and traditional products of the past need to be kept alive in their rich and authentic form, yet packaged, sold and made available – with modern sophistication. 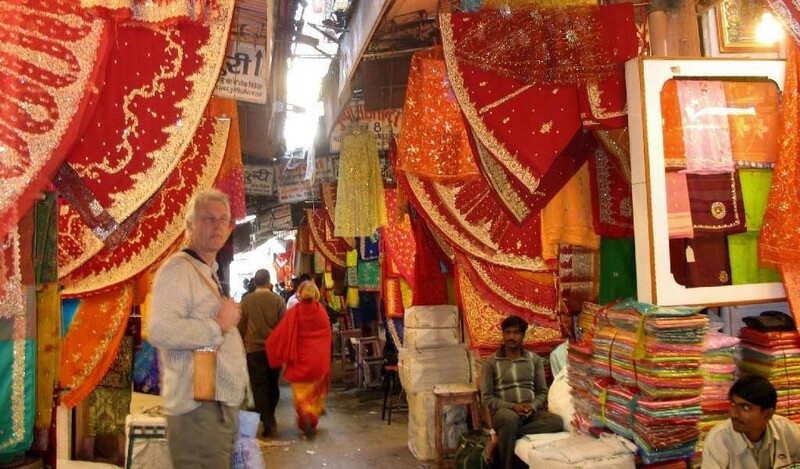 As I exhaustively and extensively scoured the Pink City’s markets, the absence of the authentic traditional products I was looking for and the presence of innumerable foreigners did make me wonder, if Jaipur – once famous for handicrafts – was now just more of a tourist destination. As I hawk-eyed my way from shop to shop and street to street, all I saw were hoards of synthetic and “zari” “gota” borders on windows, and I couldn’t get my hands on any authentic fabrics. Calling me ‘Handloom-Crazy’ is an understatement, and so my heart sank with each shop I found absent of any authentic cotton or silk Bandhani in the collection. So left with no choice, I consulted my last resort – Google… And even then – shopping localities like Kishanpole Bazaar, Tripolia Bazaar, Chandpole Bazaar highly vouched for online, sadly didn’t offer the quality I was looking for. When even Google fails you, all that’s left is to use the traditional Indian search – i.e. asking my many eager-to-guide fellow Indians. And as expected of this particular search engine, I was mostly led to various “Grameen Udyogs” or Emporiums (especially by my all-knowing rickshaw driver) – to drive their sails. The prices which they quoted never matched the quality of products being sold. Ask for authentic Rajasthani handicrafts or handlooms and expect to be taken to these places or local vendors selling fake chiffon/synthetic loud Sarees, proudly claiming they deliver to Amazon or Snapdeal *eye-roll*… Ask them – why not then buy them there, instead of coming all the way here to find cheap variations, and you get the trademark matter-of-fact Indian bobble-head-shake. 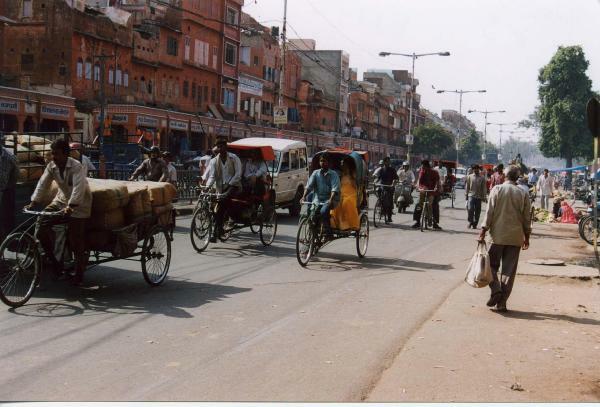 Travel Tip – if you’re Indian, always amply communicate to your rickshaw driver that you’re not a tourist, sheer in advance. Even most of the silver merchants I found – have relocated themselves to air-conditioned silver emporiums. I reminisced the old days of the ‘Munshi ji’ famously portrayed in old black and white movies sitting on the “gala” (wooden inclined table) selling heaps of silver. Nonetheless, replacing reminiscence with adamant determination, I refused to give up and after miles of exploration on foot, I finally found a few pigeon-hole shops selling authentic silver! My parched desire for authenticity was finally given drink, and as I flustered to pick as much as I could with my limited budget – it took me quite a while, before I could move on. Every piece of authentic silver in my hand left me with a sense of awe, though at the back of my head I pondered the scope for this amazing art form to be appreciated today, especially with the current Sterling Silver and German silver craze. For this artistic tradition to survive – just how many people would be willing to hunt hard and long like I had to in order to get hold of these rare authentic finds, with a strong intention to come back again to buy more? I couldn’t help but ponder on the time-warp India’s Pink City seems to be in, swinging between tradition and modernity. The barely maintained sprawling bazaars built into the city’s old structures on one extreme, were contrasted by malls on the other corners. My endless pursuit for authenticity in the markets of India’s Pink City, has taught me to keep a sharp eye out for synthetic products. In the name of vegetable dyes there are chemical dyes taking over with no assurance on the quality. In the name of silver, German silver is sold openly and unless you really have an eye for detail you can be easily be fooled. Gems appear to be sold like pebbles on the street. In the name of camel leather, local synthetic leather is used to suffice the quantity and pricing. There’s Bapu Bazaar, which is a vibrant market and hangout selling Rajasthani designs on textiles, Mojaris, products made from camel skin (or so they claim, but I have my doubts ) and perfumes. Churan (digestive powder) and Suparis (mouth fresheners) are a must-pick. 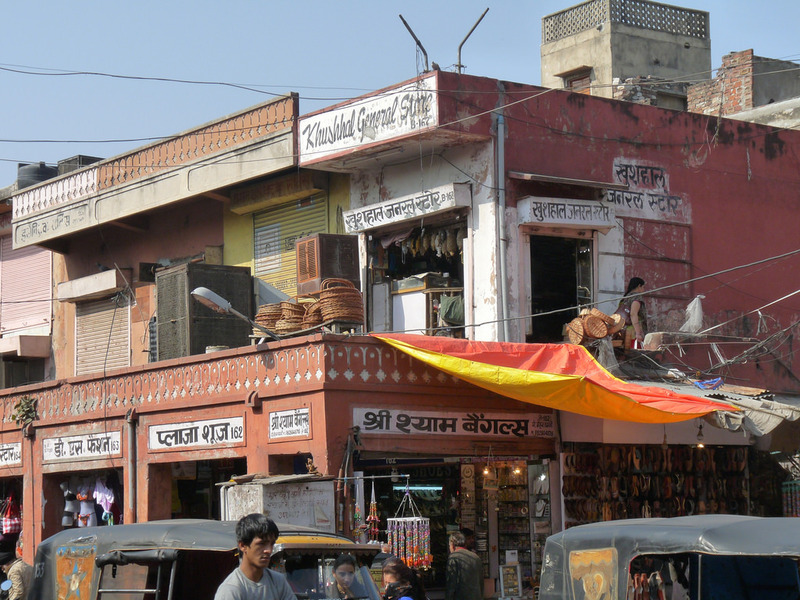 It’s also known as a wholesale market of Jaipur (which I chanced upon while exploring the inner lanes), which is otherwise a commercial market for common people, where you would find hoards of traders selling and packing their stuff to different cities. 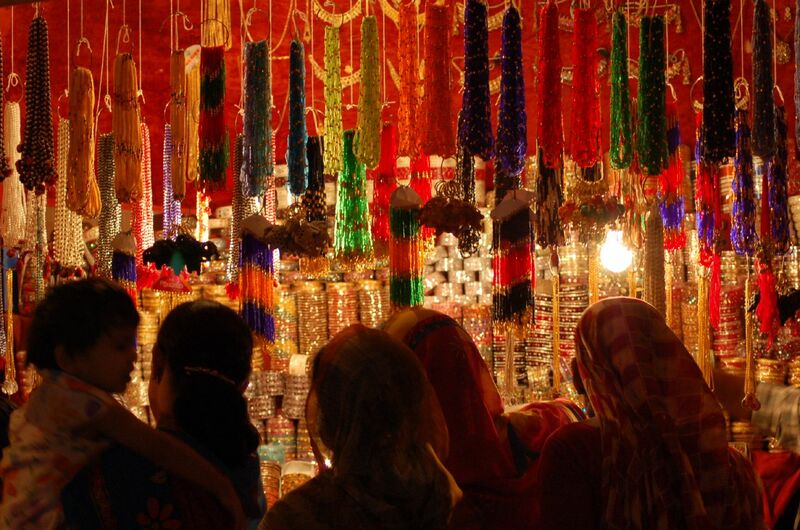 Then there’s Johari Bazaar – The heaven of tie-and-die fabrics and Jadao jewellery and as by the “Johari” you will find lots of jewellers, some of them charging exorbitantly. The streets are full of local vendors selling precious stones on the street. 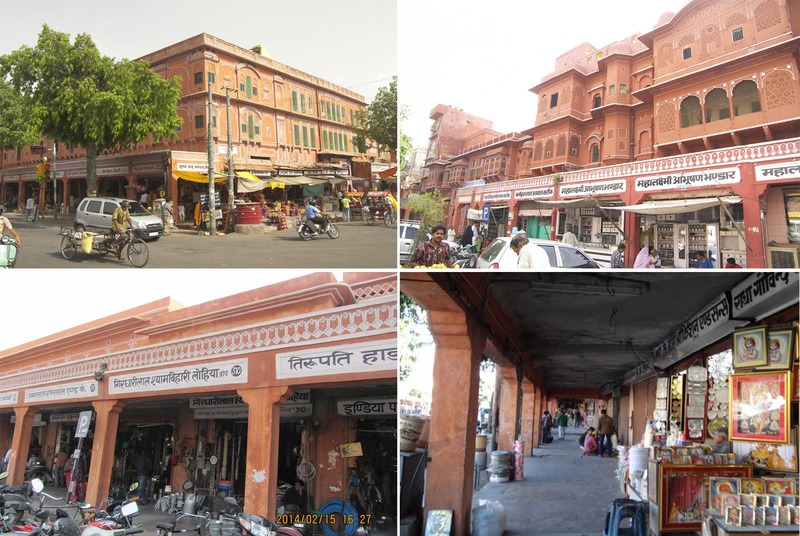 Johari Bazar is where you will find Leheriya sarees (the synthetic ones) and is the best place for shopping in Jaipur compared to its other markets. I recommend buying a plain saree and adorning it with the embroidered blouses and borders. Best known for wedding shopping, the jewel-toned fabric has panache that won’t go unnoticed. Also, remember – Jaipuri quilts are a must-buy! Despite these few finds – overall, my long and hard attempt to find unique, original, authentic manufacturers in this city did not meet as much success as I’d hoped. The Gypsy in Me and my love for Jaipur – fills me nonetheless, with a deep yearning and sense of incompleteness which will surely take me back to explore the city even more so, especially to uncover what challenges the handloom/craft industries are facing due to this synthetic growth. Yet, I wonder – Have we started to forget our roots – our History – our legacy? Somehow experiencing Jaipur’s tug of war with the two cultures of the past and present, made me reminisce Kolkata’s rich culture and history, even though there aren’t any apparent similarities to suspect between both cities. And so that’s where Advaya Tales is headed next in our pursuit to discover, revive and popularize authentic traditional handcrafted clothing, accessories and lifestyle products that we believe to be timelessly fashionable. 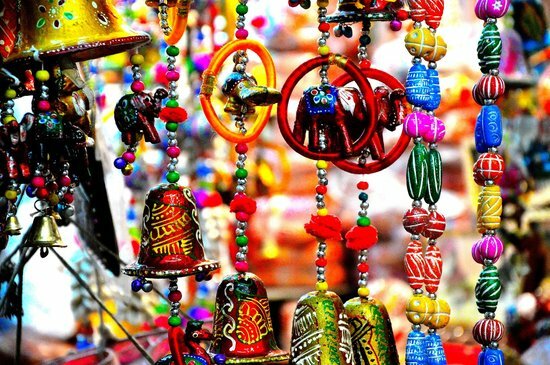 Stay tuned for a Travelogue on Kolkata – Coming soon!